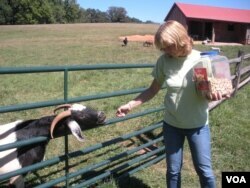 POOLESVILLE, MARYLAND — More and more Americans keep chickens, pigs and other farm animals in their backyards. And while many of them are raising their livestock responsibly, a growing number are finding the venture too burdensome. As a result, many farm animals are being abused, abandoned or killed. However, for some mistreated pigs, goats and chickens, the future is not so grim. In a quiet suburban neighborhood just outside Washington, Ali Mirsky raises chickens in her backyard. But she’s not a farmer in the traditional sense. The self-proclaimed homesteader is one of a growing number of Americans choosing to raise their own food in an urban environment. “I like the idea of seeing and caring for animals but also having access to fresh, healthy produce like eggs or meat,” she said. Mirsky says she uses a common-sense approach to caring for her backyard chickens, who roam freely in an enclosed den on her property. But not all urban farmers are as responsible. Terri Littlejohn, assistant associate director of the Prince George’s County Animal Management Division in the state of Maryland, says in addition to the dogs, cats and other pets they take in, her department is getting more and more calls to rescue farm animals. She’s noticed a trend not only in Prince George’s County, but nationwide, not just in farming communities but also in residential areas. Since the animal shelter where she works is not set up for farm animals, Littlejohn has been transporting many of them to the Poplar Spring Animal Sanctuary for abused and abandoned farm animals and wildlife, a 400-acre refuge in rural Maryland. She recently helped transport two pigs to the quiet refuge. They will be quarantined for a short period of time before joining the 200 other barnyard residents. Terry Cummings co-founded the sanctuary with her husband Dave in 1996. They work with humane societies up and down the East Coast who call them when they take animals in from cruelty cases or find them abandoned. The animal residents include horses, pigs, goats, sheep, cows, chickens, turkeys, and a variety of water fowl; ducks and geese. The animals live out the rest of their natural lives in a safe and peaceful setting, all of which is funded entirely by donations from the public. Cummings believes most urban farmers are not aware of the responsibilities and all the time and money that goes into properly caring for farm animals. She describes a batch of chickens that recently arrived on the farm. On this sunny day at the refuge, an assortment of birds -- among them roosters, turkeys and chickens -- roam free, take dust baths and sun themselves without any fear from humans. Down the hill from the chickens, a special pair of pigs have found a safe haven here after arriving at the farm earlier this year. Cummings knows each of the animals by name.